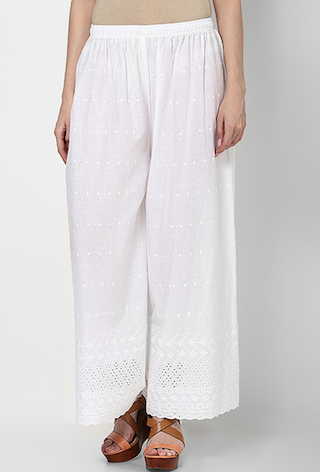 The Prettiest Palazzos To Pair With All Your Tops! We’re always looking for something comfortable but pretty to wear with our kurtas and we definitely want a break from our churidars, salwars and patialas and want to get into something stylish yet easy. The solution? Palazzos, of course! We’ve got a whole lot of fresh options for you to choose from to wear every day, and sometimes on special occasions too! 1. The Geometric Printed One! 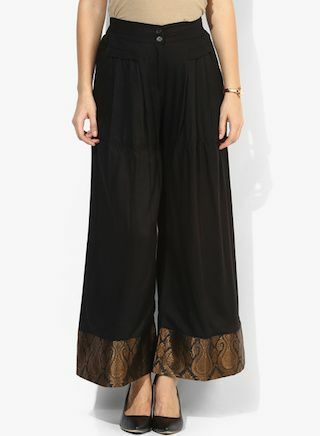 This jazzy pair of palazzos is perfect for the nights when you want to look extra-special. 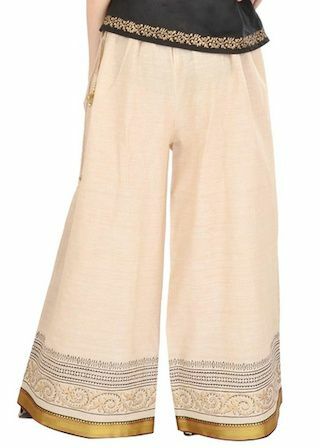 Team this with an anarkali or a straight plain black kurta and add some gold accessories to complete the look! Price: Rs 779. Buy it here. 2. The Playful Blue One! 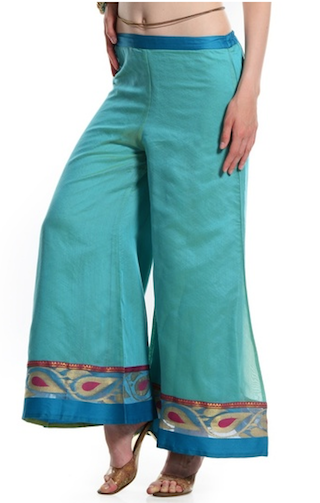 This exciting pair of palazzos is so pretty and voluminous that we would love to get it. Those symmetrical block printed patterns make this one seem so unique! Price: Rs 648. Buy it here. 3. The Happy Pink One! 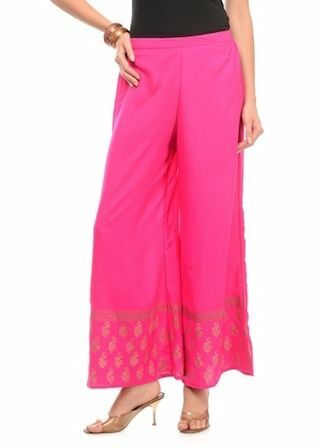 This pink fitted palazzo with half printed details is going to be on all our wishlists. Simply because of the fact this sweet hued pair will not just brighten your outfit but your mood too! Price: Rs 799. Buy it here. 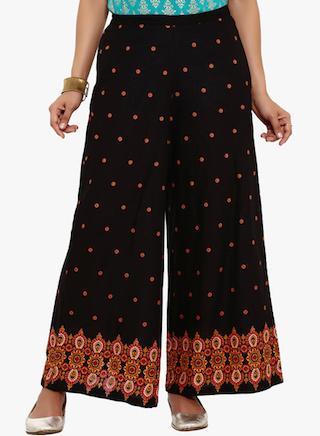 This traditional printed pair of black palazzos will look so amazing with a short kurti and even a top. The intricate details at the hemline grabs attention in the right way - and the price! We’re loving it! Price: Rs 399. Buy it here. 5. The Intense Printed One! 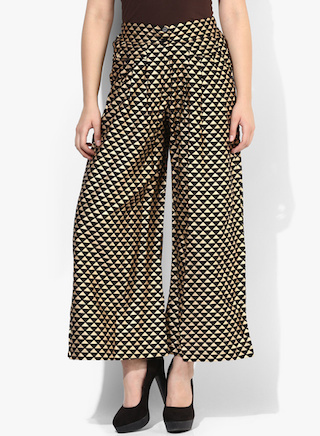 This gorgeous printed palazzos are so enticing because of all those tiny print motifs, and we want to get our hands on them. Team this up with an off-white kurta or go for a rani pink one. They’ll both look amazing! Price: Rs 540. Buy it here. 6. The Golden Shine At The End! The rich brocade detail on the edges is so beautiful that we cannot stop staring at it. Perfect to go for a evening party! Finish this look with a complementing silk kurta and put on some tiny gold earrings. Price: Rs 779. Buy it here. This basic, simple pair of palazzos will make any kurta look more elegant and thus should be your pick when you want to look sophisticated in a subtle way. Price: Rs 909. Buy it here. 8. The Dip Dyed One! This colorful leheriya pair is one that is totally befitting for all those pujas and festival get-togethers that are coming up. Those tiny pom poms add adequate drama to the palazzos and look so cute too! Price: Rs 909. Buy it here. 9. The Pristine White One! 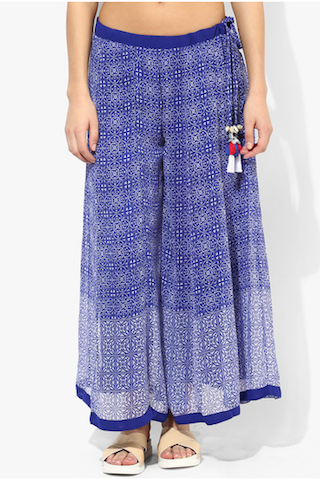 Matching seamlessly with any solid colored kurta, this one is a pure savior when it comes to our lowers game. An essential every girl should have in her wardrobe. Price: Rs 699. Buy it here. 10. The Deep Colored One! 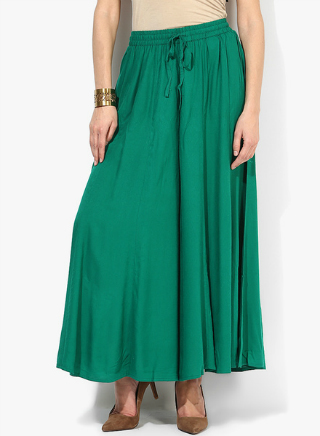 This easygoing and simple green palazzo is something we’d love to live in forever. It’s very flowy and those pleats that open up on the hips give this an extra flow. Match it with a contrasting colored kurta and you are set! Dressy enough for a party and pretty enough to be worn otherwise too. This turquoise gorgeousness is so pleasing, pairing it with red or beige sounds like a good idea to turn up fresh! Price: Rs 799. Buy it here. 12. The Abstract Printed One! A very modern version of the palazzo, we must say! 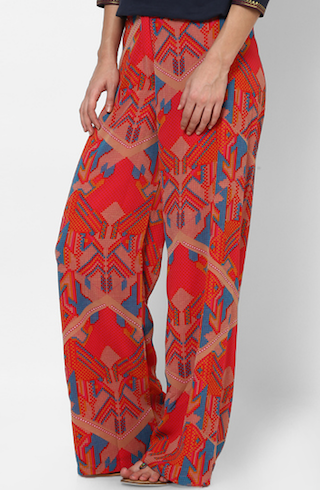 But we couldn’t stay away from this eccentric print. 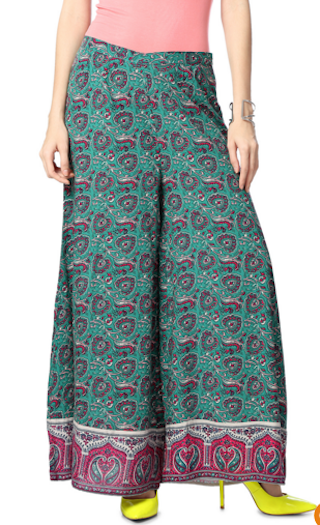 Wear this with button town tunics and kurtas and make a statement! Price: Rs 950. Buy it here. MUST-READ: 10 Party Bags Under Rs 1,000! WOW! MUST-READ: 12 Kurtis SO Pretty That You Can Even Wear Them To Parties!